Never underestimate the power of simple office supplies. 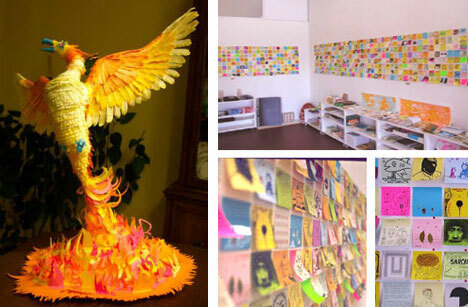 Post-It Notes come in many vibrant colors and provide everything from a building block for engaging sculptures to a collection of blank slates for interactive community art projects. 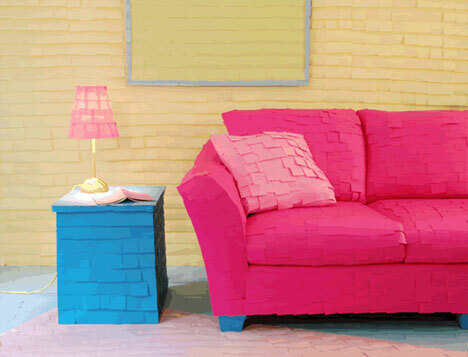 Here are 16 projects that involve covering, cladding, sculpting and decorating with simply sticky pieces of paper. And see more in our huge collection of Extraordinary Art from Ordinary Objects. 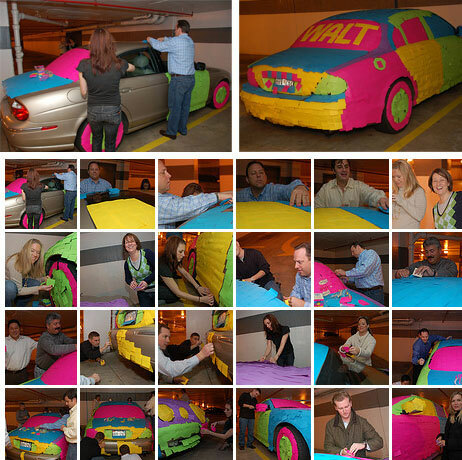 Do you suppose the owner of this vehicle was entertained or furious when he came back to find his car plastered in bright pink, blue, purple and green sticky notes? It might not be high art but it certainly makes a pop impression Warhol may have admired. It’s almost hard to look at this incredibly vibrant wall of notes by PostTypography without your vision swimming somewhat. The stark contrast between the wall and the rest of the room creates a surreal backdrop an otherwise ordinary space. There’s no reason that this kind of art needs to be limited to non-representational forms. 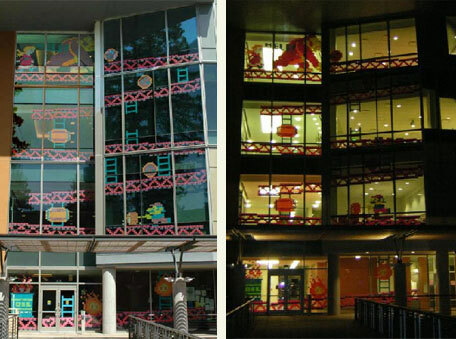 In this case the artists playfully took advantage of multiple stories of glass frontage to create a nifty illusion recalling a classic video game that appears both day and night. If Donkey Kong, then why not Ray Charles and Elvis as well? Once you get started with this kind of art there really aren’t many limitations, particularly at a larger scale and from a distance. The outcome is predictable but the effect is nonetheless interesting. 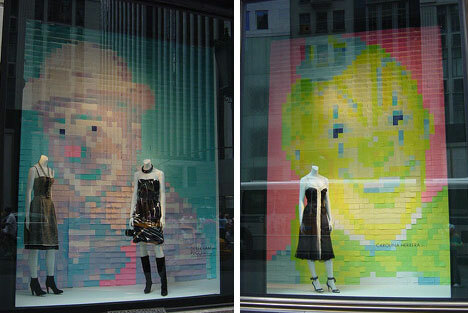 Post-It projects also don’t have to simply be interesting things to look at. 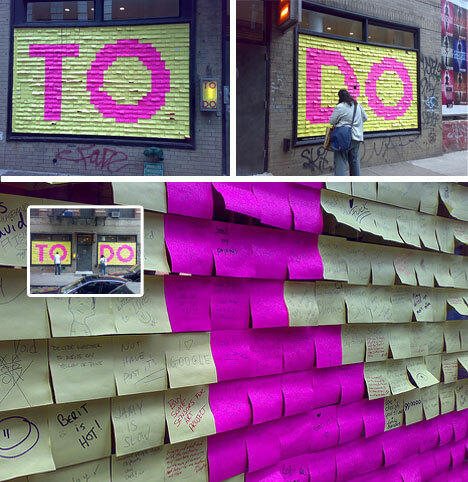 In this case, passers by were encouraged to contribute to the wall by writing their to-do lists and leaving them in place for all to see – a kind of civic group exercise in sharing and organization. 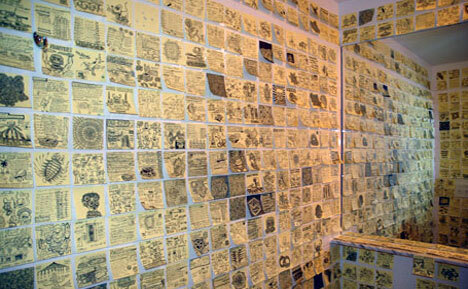 Taking things a step further, each note can become a blank slate, a simple and small canvass that can be individualized at a limited scale and then begins to form accidental visual patterns when viewed from a distance. But why stop there? 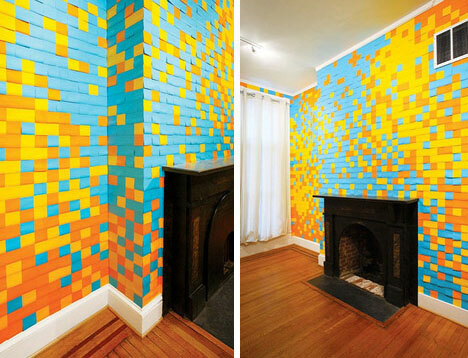 Why not just plaster everything in notes like Rebecca Murtaugh has done in the photograph above? She didn’t stop with the living room, either, but also covered her bedroom and various other furniture objects. It may be a bit too much if your boss catches you, but you don’t necessarily have to stick to posting over your own furniture and spaces. 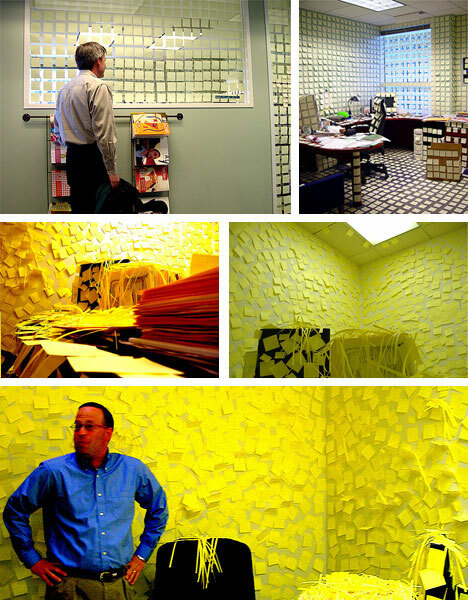 Still, smothering an office with sticky notes is at least a good alternative to staring at the clock waiting for the day to end, right? So you have the theory down, now there are a few other creative ways to put this art into practice. 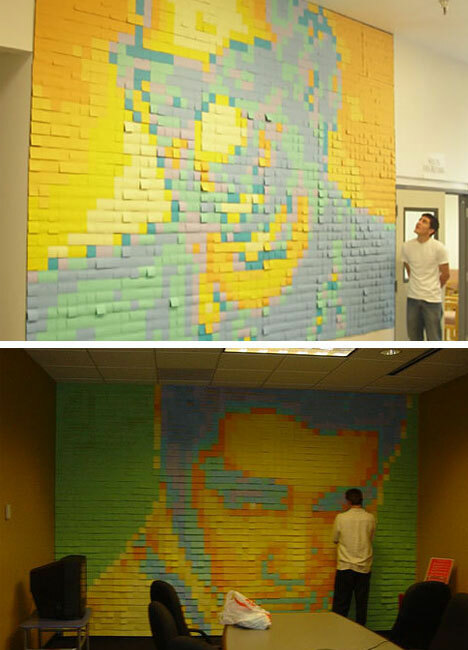 Since Post-Its are simple to use, compact and easy to rearrange they make perfect material to form the basis of a stop-motion animation film such as the one above.